Formula G International was founded in 1986, by Lorenzo Gigliotti, as a business investment and management company. As a result of the firm's retail interests, the development of business application software became an integral part of the company's focus. The development of analytical software, allowed the evaluation of business scenarios and revealed that there were often a myriad of nonlinear and seemingly unrelated factors that could have profound effects on client businesses. The company continuously developed new applications for computer interfacing and bookkeeping. New and improved methods were constantly implemented to maximize the efficiency of client-businesses. By 1994, Gigliotti had also interfaced this software to a completely automated retail system, with software-controlled inventories, electronic ordering and automated bookkeeping. The utilization of electronic bulletin boards and forums for business development began as early as 1986. Over the years he cultivated business friendships and relationships with programmers and IT professionals all over the world -- Italy, Germany, The United Kingdom, Canada, Hong Kong... It was the development of this network, which continues to make G-site Web & Consulting viable today. As early as 1992 telecommuting models were developed by Gigliotti which enabled multiple remote operations to be handled by computer from any distance -- a physical presence at a client site became almost completely unnecessary. 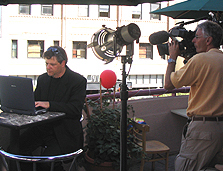 Lorenzo Gigliotti demonstrates the Long Beach Hot Zone during taping of a piece about WiFi to be featured on Peter Greenberg's Travel Expert segment of the "NBC Today Show." In 1994 Formula G became focused upon the Internet and created G-site Web Development & Consulting. Initial work revolved around working with individuals and businesses desiring a positive and powerful web presence. The firm's ability to adapt quickly to an ever changing marketplace and its uncanny ability to stay ahead of the technology curve earned G-site Web a reputation for getting any job done! Corporate and municipal clients soon followed -- even other Internet companies have utilized G-site Web's pool of talent and tech resources! G-site Web & Consulting, has always maintained focus on its primary objectives and fundamental operating-philosophy -- simply put: "We do not view business as a ruthless competition guided by the "bottom line -- quite the contrary, we see business as a sincere effort to satisfy clients first, and then earn a profit. " G-site Web continues to do business that same way today and has been based in Long Beach, California for many years -- stability in a company is a very important measure. In a world where most web companies don't even last long enough to have a history, G-site's longevity and stability reassures clients of the firm's integrity. G-site Founder, Lorenzo Gigliotti, is a member of numerous technology organizations, including The Mayor's Technology Advisory Group, The Chamber of Commerce Technology Committee, The Strategic Marketing Technology Committee (SMI), is a founding member of numerous other tech organizations as well. He is also active in the community as a volunteer in educational and youth sports organizations. Lorenzo Gigliotti and G-site Web are partners with the City of Long Beach, Intermec, Vernier Networks, Color Broadband and Development Tech in one of the first large-scale municipal wireless projects in the world, known as the Long Beach "Hot Zone." More information on these ongoing projects may be found at LongBeachPortals.com. As a comprehensive provider of digital business solutions, G-site has also been contracted to perform advanced technical and consulting services for other internet services and web design firms.